The rabbis were easily identified among the protestors. Albert Hoschander Friedlander (then the rabbi for students at Columbia University) noted in his account, “Since the ministers generally wore ‘collars,’ we wore yarmulkes. But a problem presented itself: the yarmulke was becoming fashionable! Called ‘freedom cap’ by the Negroes, it became a mark of distinction in Selma—and the hottest item on the market.” Several of the rabbis remembered Sabbath services with particular warmth. Rabbi Herbert D. Teitelbaum (Redwood City, California) described one service in his journal: “Toward evening, as the Sabbath approached, my fellow rabbis appointed me to conduct the shabbat service we had planned to hold in Brown’s Chapel. As we worshiped, I was amazed at the extent of the participation. Quite a few of the people, it turned out, were Jewish. We sang the closing hymn, Adon Olam, to the melody of ‘We Shall Overcome.’” Many of the rabbis remember services attended by people of all faiths—some in jails. 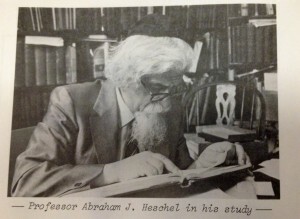 For more information about the Abraham Joshua Heschel papers please visit http://bit.ly/1u20k3z. In photograph, leaders of the third Selma-to-Montgomery March being interviewed by the press. 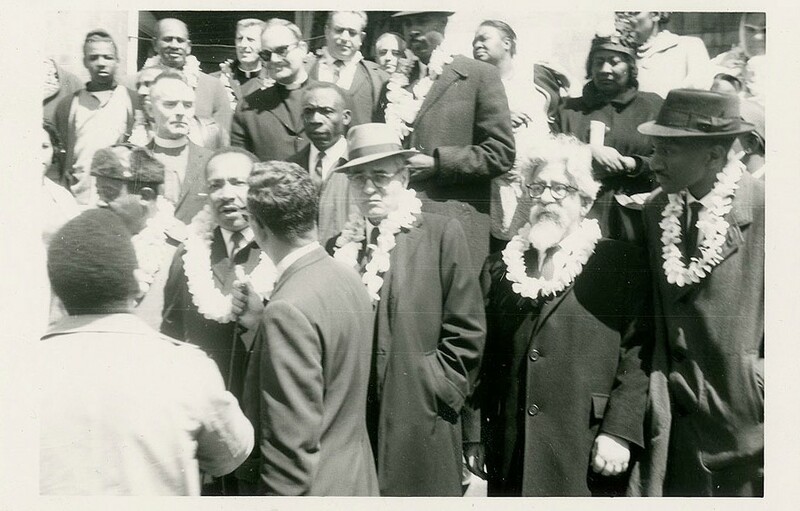 Front row: Ralph David Abernathy; Martin Luther King, Jr.; Ralph Bunche; Rabbi Abraham Joshua Heschel; Frederick Douglas Reese. Photographer unknown. Abraham Joshua Heschel papers. 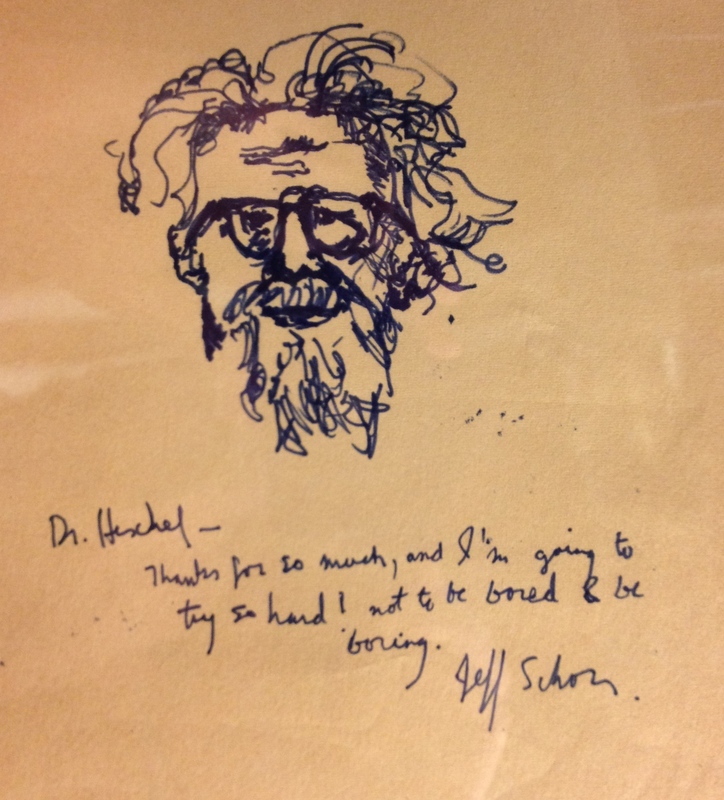 Abraham Joshua Heschel Papers are Open! 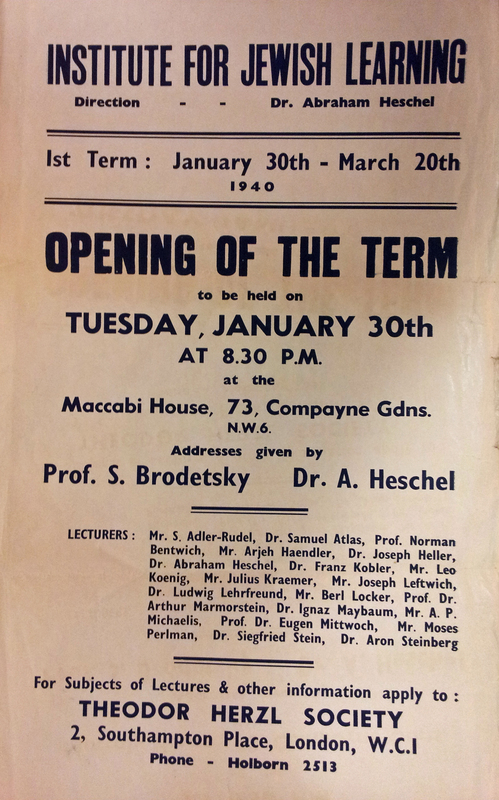 Today the Abraham Joshua Heschel papers are officially opened and available for use. Having just finished processing the collection with a crack team of interns (thank you Adrienne Krone, Sam Kessler, Annegret Oehme, and Emanuel Fiano! ), I can attest to the richness of the collection and am thrilled that patrons will be able to explore Heschel’s personal, academic, and public life. The collection guide is available here. In total, 16 languages are represented. Materials related to all of Heschel’s published books, along with 145 published articles are also in the collection. Some of the more unique and unexpected items in the collection include an audio reel of the broadcasted radio show “Way to Go” with host Ormond Drake in which Heschel speaks about his personal life, an original typed document of Heschel’s deportation from Frankfurt in 1938, and a telegram from President John F. Kennedy requesting Heschel’s presence at the White House. Look for an opening event sometime in October that will feature Susannah Heschel! 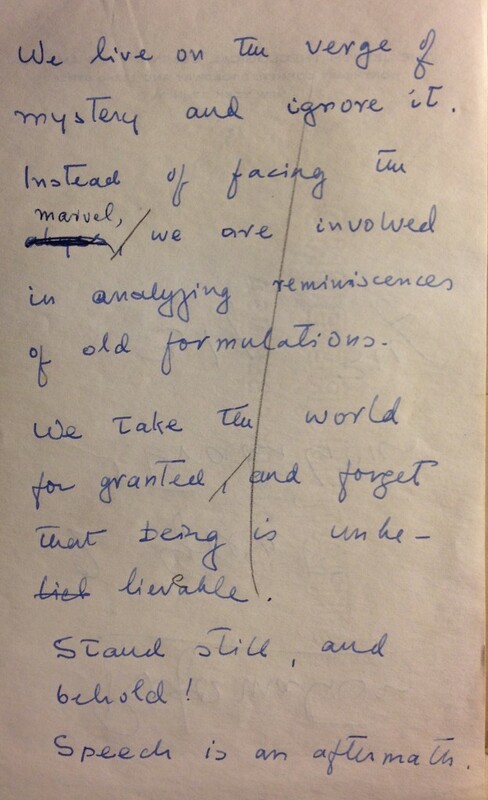 The Abraham Joshua Heschel papers abound with examples of Heschel’s commitment to interfaith work as well as commemorations written after Heschel’s death, and the commemoration quoted above highlights both of these aspects. Jacob Teshima, the author of the commemoration above, was a student of Heschel’s at the Jewish Theological Seminary (JTS). He was also the son of Ikuro Teshima, founder of the Japanese Makuya (tabernacle) movement, or the Original Gospel Movement. The Makuya movement is made up of Japanese Christians who are dedicated to a return to the faith of Hebraic Christianity. This commemoration appeared in a publication of the movement, The Weekly Original Gospel. As part of his commitment to Israel and its people, Ikuro Teshima encouraged Makuya members to learn Hebrew and visit Israel. Ikuro Teshima met with many Jewish leaders in his lifetime including Martin Buber and Zvi Yehuda Kook and spread their teachings to Makuya members. 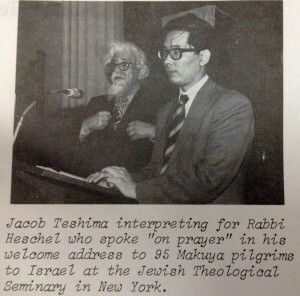 When Jacob Teshima was learning from Heschel at JTS, Ikuro Teshima and Heschel began corresponding. According to the letters we have in the Abraham Joshua Heschel papers, Ikuro Teshima hoped to bring Heschel to Japan. On April 23, 1971, Teshima wrote that his son Jacob was “thoroughly enjoying” Heschel’s class and invited Heschel to give lectures in Tokyo and Osaka. He offered to book the round trip air-ticket and was eagerly awaiting his arrival. 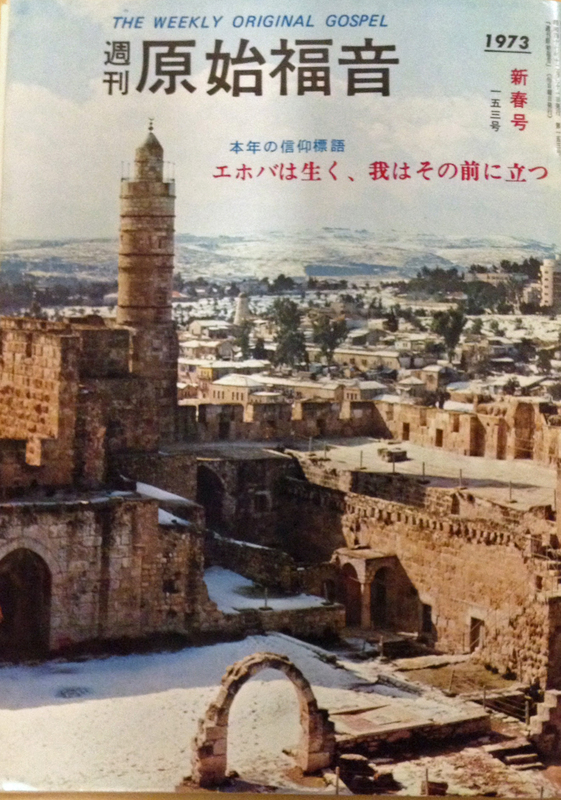 “Shalom from Japan!” another letter from July 22, 1971 began excitedly. The letter continued, “Our prayer is that, after your visit to Japan, you will remember Japan as your third home, perhaps dearer than America.” Besides extending these invitations to Heschel, Ikuro Teshima also translated God in Search of Man into Japanese and published his translation. 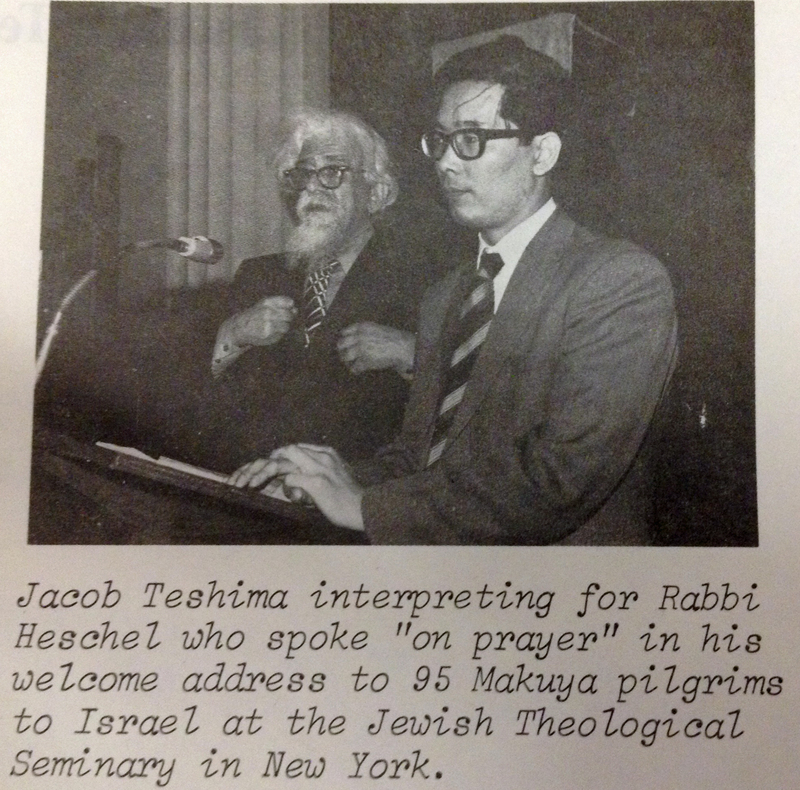 In his commemoration, Jacob Teshima included a vignette about a meeting with Heschel on December 22, 1972. Jacob quoted Heschel’s words that afternoon: “Jacob, when I regain my strength, but who knows when that will be; maybe February if I’m lucky; anyhow in May, I hope to visit Japan. I hope you’ll accompany me, Jacob. I’d like to meet your father and see the Makuya people who are so aflame with God’s love.” Unfortunately, Heschel passed away the next day and never fulfilled his wish to visit Japan. But thanks to the Makuya movement’s translation of his books and their dedication to his teachings, Heschel’s presence is alive and well in Japan. Anyone familiar with Abraham Joshua Heschel’s English writings has encountered the distinctive cadence of his sentences. From the early book The Earth is the Lord’s (1949) to his final work A Passion for Truth (1973), one can hear and feel the rhythm that we now all find so familiar. Reliant on evocative words, on short phrases strung together mostly through suggestions, his sentences pile steadily one atop another, compelled from within as if by their own heartbeat. Heschel saved nearly every scrap of paper on which he wrote. From napkins and hotel stationary to JTS announcements and publisher’s proofs, often what we record in the database is only the “front” of the page—what appears to us to be a paper’s final use. 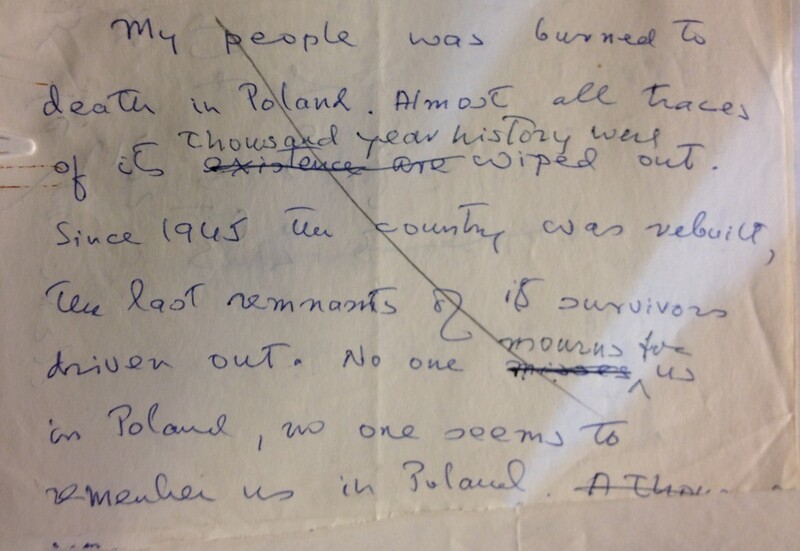 But the other side, the crossed out side, is often just as lively, covered in sentence fragments, Talmudic quotations, half-written letters of thanks or condolence. Often these backsides record, as if by sheer happenstance, a couple of seconds of Heschel’s mind, a brief instance when a thought, a turn of phrase, caught him amid other actions and was hastily scribbled down. More often than not Heschel returned to these scraps, edited them, sounding after each change more rhythmically alike to the unhurried but morally tugging voice that characterize his finished prose. 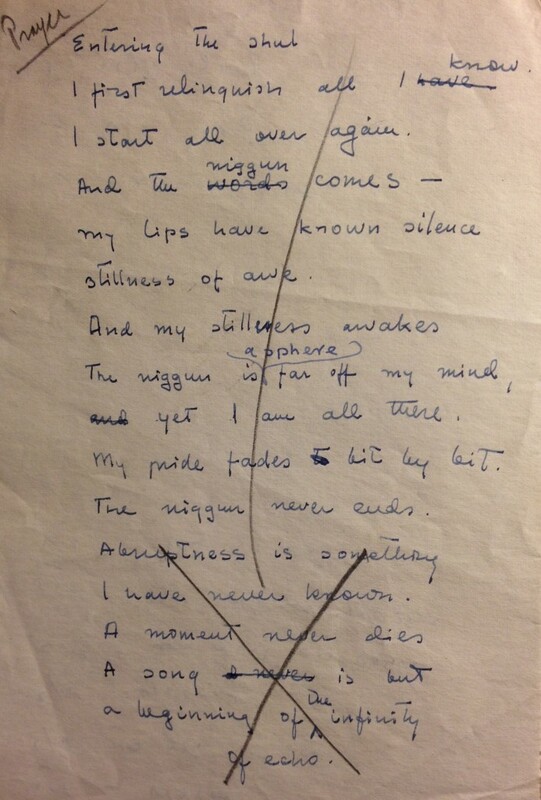 Though he wrote almost without ceasing, few of Heschel’s notes reveal autobiographical awareness. “I” was not a word he employed readily. Coming upon a personal reflection can feel momentous. I first relinquish all I have know. and yet I am all there. My pride fades to bit by bit. But sometimes, too, there are the pages punctuated by sadness, when the search for God recedes behind the dark memory of all that Heschel, and Judaism, has lost. 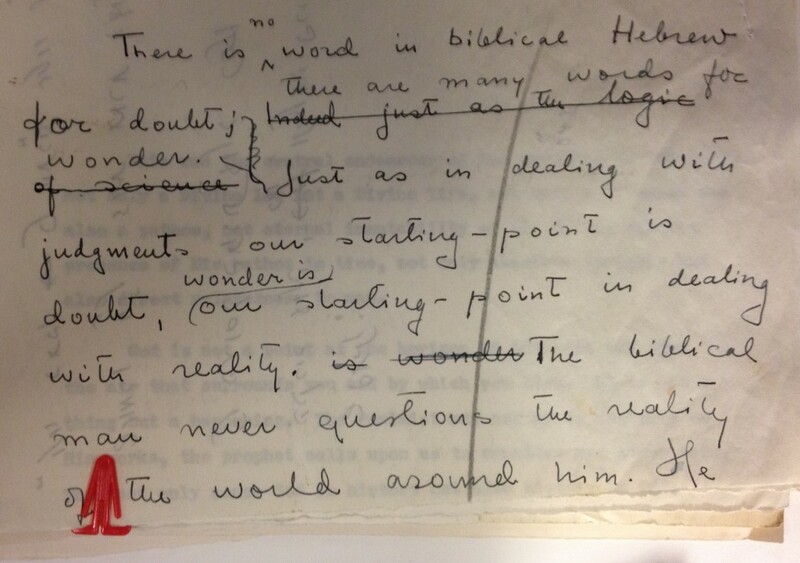 Post contributed by Samuel J. Kessler, intern for the Abraham Joshua Heschel processing project. Some of our recent interesting conservation projects have involved housing. Not only do we repair damaged books and paper items in the conservation lab, but we also make many boxes and enclosures to house them, and occasionally our box-making expertise is called upon for rather unusual items. For example, from the Abraham Joshua Heschel Papers: a rock. 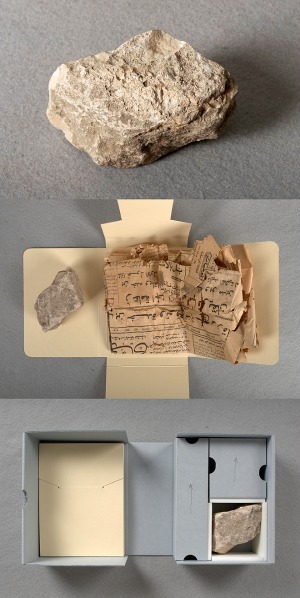 Little is known about this small piece of rock except that it is a souvenir of a trip that Heschel made to Israel. The rock was originally wrapped in a newspaper. Tedd Anderson made a four-flap enclosure for the newspaper and a box to house both the rock and the newspaper enclosure. Rachel Penniman has been working on a set of Charles Dickens’s publications, the original short segments of his novels that came out in serial form. These serials had been housed in custom boxes that someone must have made for their personal collection. 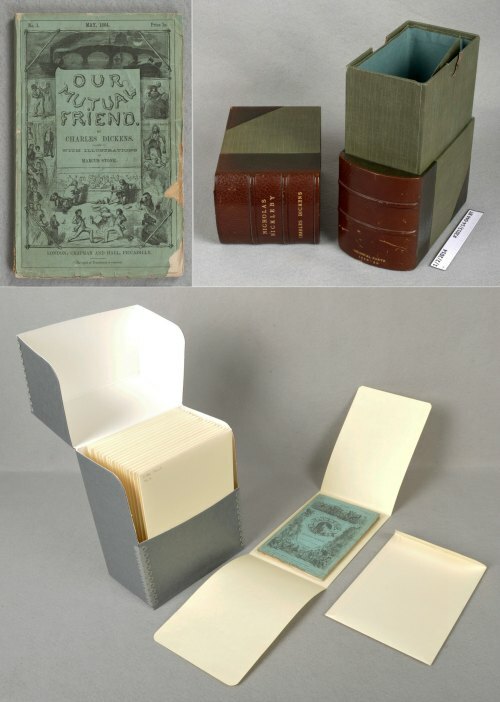 Although the boxes were attractive with leather spines and stamped titles, they were not safe for the serials. The boxes caused creases and abrasions each time one of the pamphlets was removed or reinserted. Rachel made individual enclosures for each serial issue, and the enclosures were housed together in larger boxes, one for each title. Access to the serials is now much easier and safer. The Digital Production Center (DPC) is in the process of scanning glass lantern slides of scenes of daily life in China made by Sidney Gamble in the early 20th century. 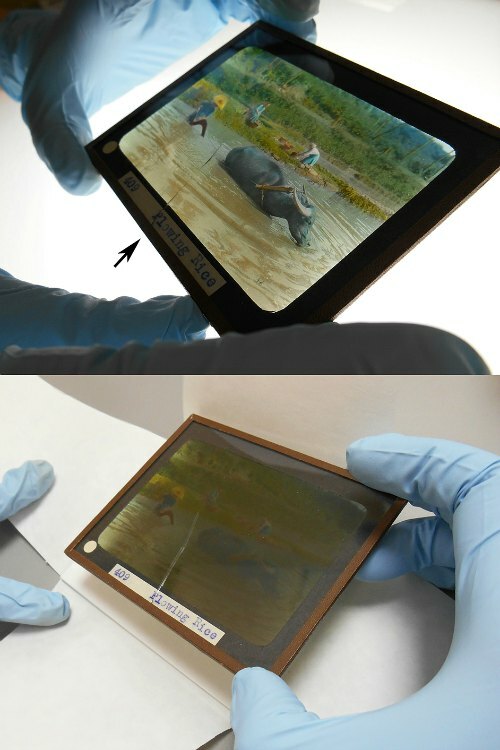 Many of the slides are hand-colored, some have existing cracks, and all are very fragile because of the glass support. Erin Hammeke has been working to stabilize their housings. Each slide is housed in a labeled four-flap paper wrapper, and in the case of cracked slides, she adds a piece of mat board as an extra stiffener. The conservation department creates housings for circulating collections as well. Mary Yordy has an upcoming housing project for the fascinating new book S by J.J. Abrams and Doug Dorst. 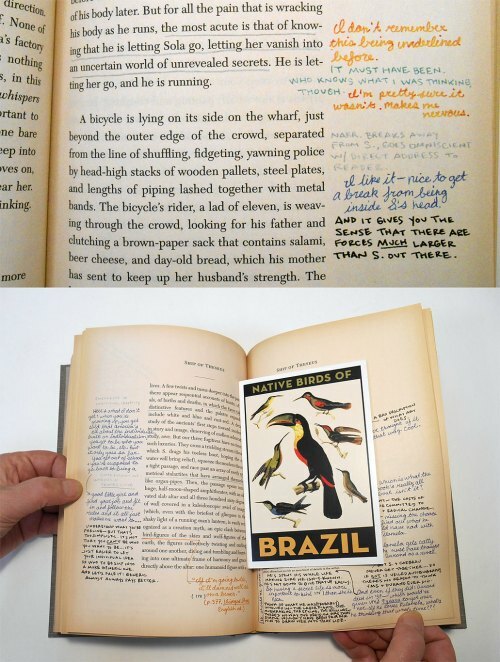 The book is beautifully made to look old and well used with notes in the margins and numerous loose paper inserts. Mary is planning to make a box for the book that will prevent loose materials from falling out and getting lost, and the book will be kept in the locked stacks. While we chose to leave the inserts untreated and as published, the Preservation Lab at the Public Library of Cincinnati/University of Cincinnati decided on another route with this title. More images of these and other housing projects can be seen on Flickr. Post contributed by Grace White, Conservator for Special Collections, as part of our ongoing “In the Conservation Lab” series. Welcome to the fifth post in a series documenting the processing of the Abraham Joshua Heschel Papers. 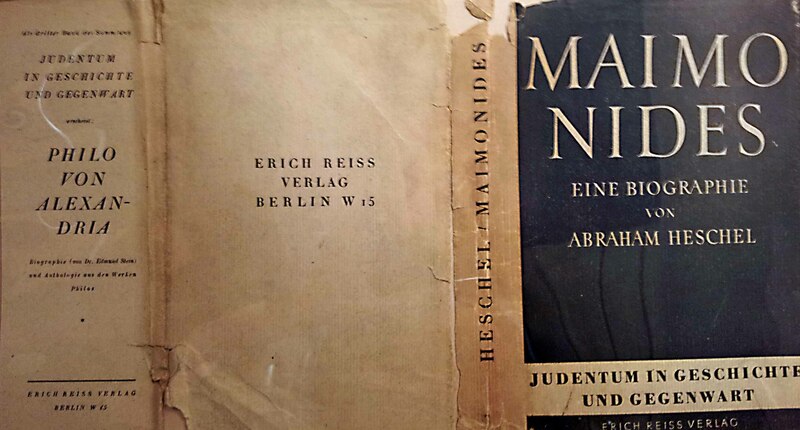 Dust jacket from first edition of Maimonides eine Biographie, 1935. Completed in only 7 months, the book was Heschel’s first major work. He was 28 years old. Poster, Opening of the Term at the Institute for Jewish Learning, London, 1940. Heschel’s article “Answer to Einstein” in the newspaper Aufbau (Reconstruction) which was a rebuttal to Albert Einstein’s paper “Science and Religion.” As a recent immigrant, this was an audacious and surprising move for Heschel. Post contributed by Mary Samouelian, Heschel Processing Archivist in Rubenstein Technical Services. Welcome to the fourth post in a series documenting the processing of the Abraham Joshua Heschel Papers. In 1939, Julian Morgenstern helped Abraham Joshua Heschel travel from Warsaw to London just six weeks before Germany invaded Poland. In 1940, upon his arrival in the United States, Heschel began teaching at Hebrew Union College (HUC) where Julian Morgenstern was President. HUC was the main seminary for Reform Judaism in the United States and Heschel was the Associate Professor of Jewish Philosophy and Rabbinics there for five years. Heschel resigned from the HUC faculty on May 18, 1945 over ideological differences. As we process the Abraham Joshua Heschel papers, we learn more about the complex relationship between Heschel, HUC, and the leaders of Reform Judaism. Through letters, essays, handwritten notes, and his books, Heschel expressed concerns about the role of God, spirituality and adherence to Jewish law among Reform Jews. At a few points in Heschel’s life, these concerns bubbled up and he took action as part of his larger effort to infuse American Judaism with spirituality. Photographs and documents from the Heschel Papers. In 1945, Heschel’s theological divergence from HUC became a serious issue for him and he resigned his position. In a handwritten draft of his resignation letter to Morgenstern Heschel wrote “from the beginning of my affiliation with the college I fully realized that the HUC stands for a distinctive philosophy of Judaism which it tries to realize in practice and with which my own interpretation of Judaism is not in full accord.” Heschel’s resignation was accepted with sadness and respect on the part of Julian Morgenstern. In a letter dated May 19, 1945, Morgenstern wrote that he and the HUC Board of Governors wished to express their feeling that he was doing the “right and honorable thing.” A number of letters related to Heschel’s resignation echo this sentiment. Heschel’s students, colleagues and friends approved of Heschel’s decision and wished him well. Despite his issues with the philosophy of HUC, Heschel expressed an interest in sustaining his friendship with Morgenstern in his resignation letter: “I earnestly hope and wish, however, that the cordiality and warmth of our friendship will not be impaired by my leaving this institution.” It is clear from the amount of correspondence from Morgenstern that their friendship continued until Heschel’s death. From the correspondence surrounding Heschel’s resignation from HUC (and subsequent acceptance of a position as Associate Professor of Jewish Ethics and Mysticism at the Jewish Theological Seminary) it seems that Heschel continued to be on good terms with many of the acquaintances and friends that he made during his time at HUC. However, his ideological differences remained. In 1953, Heschel caused a stir among his Reform colleagues when he gave an address to the Reform Rabbinic Organization, the Central Conference of American Rabbis (CCAR), entitled “Towards an Understanding of Halacha.” Heschel appears to have denounced the CCAR for failing to hold to the doctrine of Halacha (Jewish law) in this address. From the correspondence we have surrounding the address and its subsequent publication by the CCAR, it is clear that Heschel earned himself both admirers and detractors as a result. 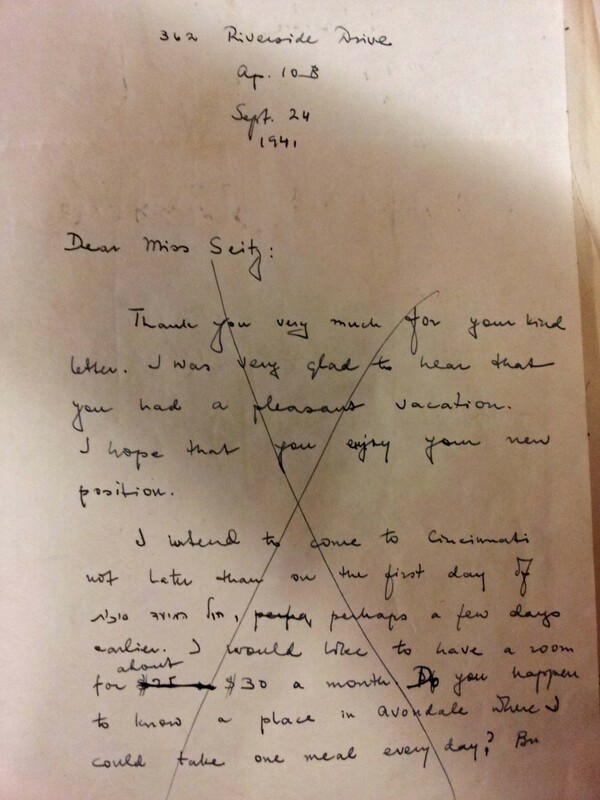 However, even the harshest letters reveal a great deal of respect for Heschel. A 1954 letter that begins with the exclamation “I am profoundly shocked by your persistent misinterpretation of Reform’s position on practice” concludes with the author, a reform rabbi, noting that Heschel could be helpful to the Reform movement as they move forward. Another letter from a Reform rabbi seems wary of Heschel’s denunciation of the CCAR but the author also wrote that “all your papers have a few extra calories of spiritual warmth which lift the heart.” And yet another rabbi’s letter reveals the power of a meeting with Heschel to assuage anger: “But of my prior disturbance, I can say ‘gam zu l’tovah’ [this is also for good] for it provided the occasion for a most stimulating and edifying chat with you.” Heschel remained in constant communication with Reform Rabbis and the leaders of the Reform movement throughout his life and his correspondence reveals that this exchange was beneficial to Heschel, to many Reform rabbis and perhaps even to Reform Judaism. Post contributed by Adrienne Krone, Heschel Project Assistant in Rubenstein Technical Services. Welcome to the third post in a series documenting the processing of the Abraham Joshua Heschel Papers. One of the most intriguing features of the Abraham Joshua Heschel collection is its ability not only to shed light, by virtue of the abundance and diversity of the materials it contains, on his intellectual biography, private persona, and scholarly and political work, but also to comment widely on a variety of issues related to the contemporary public and private sphere in the United States. Among such issues are certainly the socialization of the function of secular and religious thinkers and the material importance of correspondence in the establishment and furthering of social networks and intellectual affinities. More particularly, in the case of as prominent and publicly exposed a figure as Heschel, it is interesting to notice the recurrence with which individuals of different persuasions, professions and social standing, struck by the reading of his works, spontaneously set out to address him letters. They often did so in order to offer their perspective on an issue they deemed dear to him, expose their views about various religious problems, or simply secure an opportunity to meet him in person. The particular sub-genre emerging from these “first letters,” in which an awkwardly deferential act of addressing turns into a self-conscious emergence from anonymity, may yield some insights into the relationship that links writing, and particularly epistolary writing, to the processes of subjectivation. One exceptional, aberrant instance of such messages-out-of-the-blue genre can be cited. It is a neatly-penned and beautifully-styled letter, spanning five columns and three sheets of paper, addressed to Heschel by Alfred R. Pulyan, one of those figures whose relative notoriety derives in part by the respectable legitimacy with which the adjective “obscure” can be attached to their names. Writing to Heschel in 1964, ostensibly about Cardinal Augustin Bea’s draft of the declaration Nostra aetate (but really about Judaism, Christianity, the awakening, and the sense of existence), Pulyan, a spiritual teacher based in South Kent, Connecticut, by the end of his letter makes no mystery of his intentions: to turn the Polish-born rabbi into one of his pupils. 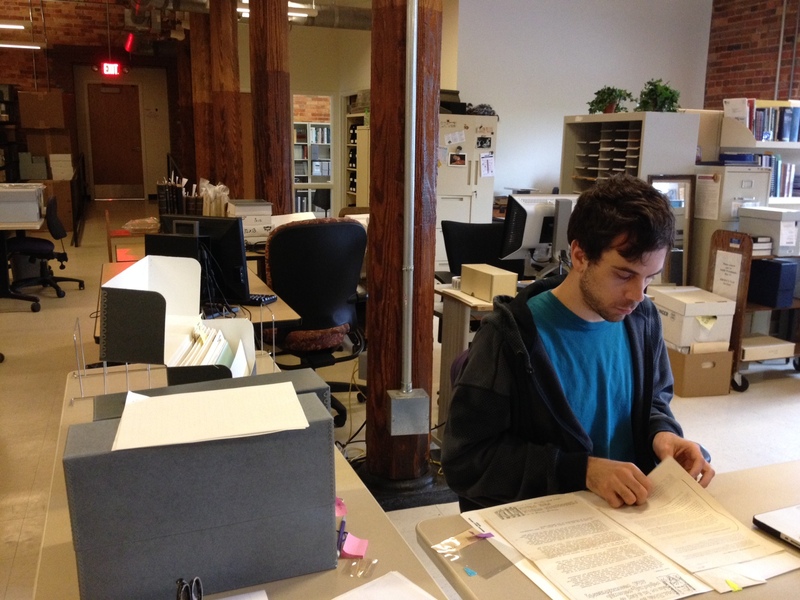 Processing Intern Emanuel works with the Heschel Papers. The esoteric teacher seems aware of the unlikelihood that his proposition hit its mark: “In your [i.e. Heschel’s] case,” he writes, “the rejoinder I judge will be neglect or rejection (the great “no” of [Constantine P.] Cavafy), unless you childishly fear I am trying to edge you into Christianity by a back door.” Whether or not the lures of Pulyan’s coquettishly uncompromising tone did indeed fall flat is difficult to tell, in the absence (for the time being) of other messages from this tough-sounding enlightened master. What the reader is left with is the charm of an unpredictably effective hortatory prose and, as is often the case with this collection, an indecipherable piece of archive, through whose very recalcitrant oracularity a glimmer of a whole universe of meaning is revealed. Post contributed by Emanuel Fiano, processing intern for the Abraham Joshua Heschel Papers in Technical Services. Welcome to the second post in a series documenting the processing of the Abraham Joshua Heschel Papers. Processing the materials in the Abraham Joshua Heschel papers over the past three months has presented interesting challenges, including deciphering a wide assortment of languages represented in the collection (we’re up to nine languages thus far) and determining date ranges for the materials. As a result, we’ve come up with some creative, yet practical solutions to address these challenges and are hopeful they will positively affect how researchers interact with and interpret the materials in the collection. Materials in English make up about 57% of the collection; materials in Hebrew and Yiddish about 38%; materials in German 4%; and materials in Italian, Spanish, French, Latin, and Polish about 1%. There are varying degrees of the amount of language materials in each folder and oftentimes multiple languages are represented in a single folder (sometimes in a single document!). Hebrew is particularly challenging as Heschel not only wrote in Hebrew but also frequently wrote folder titles in Hebrew. To assist researchers understand the language(s) represented in the collection and its extent, each folder description will include a note identifying the language(s) and its extent in the folder. 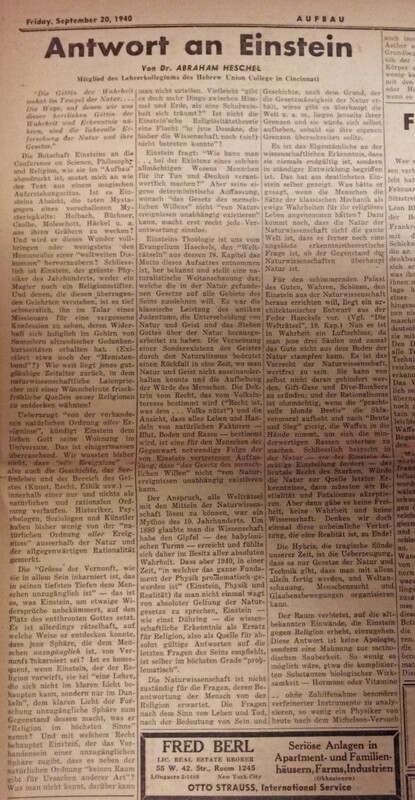 As an example, if all the materials are in German, the note will read “All materials in German,” or if there is a mix of language materials, the note may read “Most materials in German and Yiddish.” To assist researchers with the folder titles in Hebrew, we will be providing the original folder title in Hebrew, the transliteration of the title, and a translation of the title. Heschel tended not to date the materials he authored, nor did he date the folders. However, he does appear to have been a master at recycling paper for his handwritten notes. So far, we’ve discovered he reused coupons, correspondence, receipts, other handwritten notes, memoranda, and (my personal favorite) his student’s blue exam books. In many cases, turning these scraps of paper or documents over has provided essential clues to the date(s) of the materials in the folder. On the reverse side is a draft letter Heschel wrote in 1941, about a year after he arrived in the United States. He asks the recipient of the letter about the availability of a room and if she knows of a place where he could “take one meal every day.” Heschel crossed the letter off and then reused it for other purposes. Stayed tuned for more Heschel Highlights in the near future! Welcome to the first post in a series documenting the processing of the Abraham Joshua Heschel Papers. 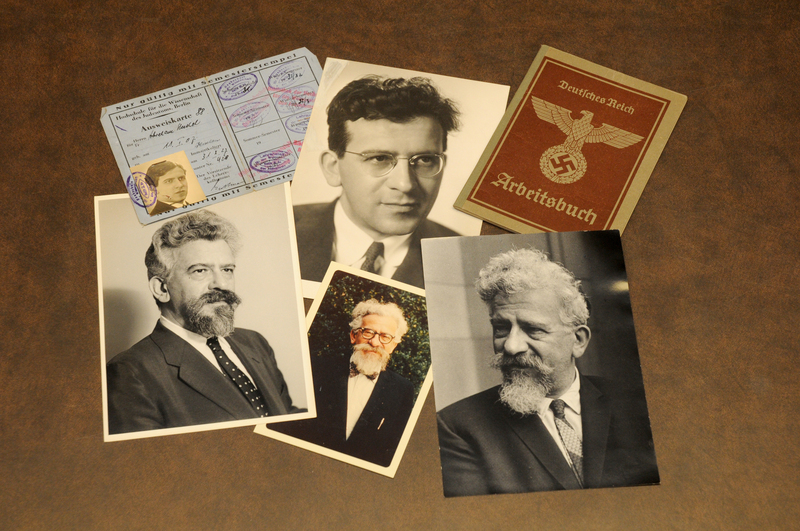 Photographs and documents from the Abraham Joshua Heschel Papers. In 1965, Rabbi Abraham Joshua Heschel, professor of Jewish Ethics and Mysticism at the Jewish Theological Seminary of America, accepted as position as the Harry Emerson Fosdick Visiting Professor at Union Theological Seminary (UTS). Newspapers reported this occasion with headlines that proclaimed “Rabbi to Teach Christians” and “Seminary Gives Post to Heschel.” The prestigious visiting position speaks to Heschel’s influence in Christian-Jewish relations at the time. As we begin processing the Abraham Joshua Heschel Papers, there is evidence that Heschel’s dedication to interfaith work also made him a controversial figure in some Jewish circles. 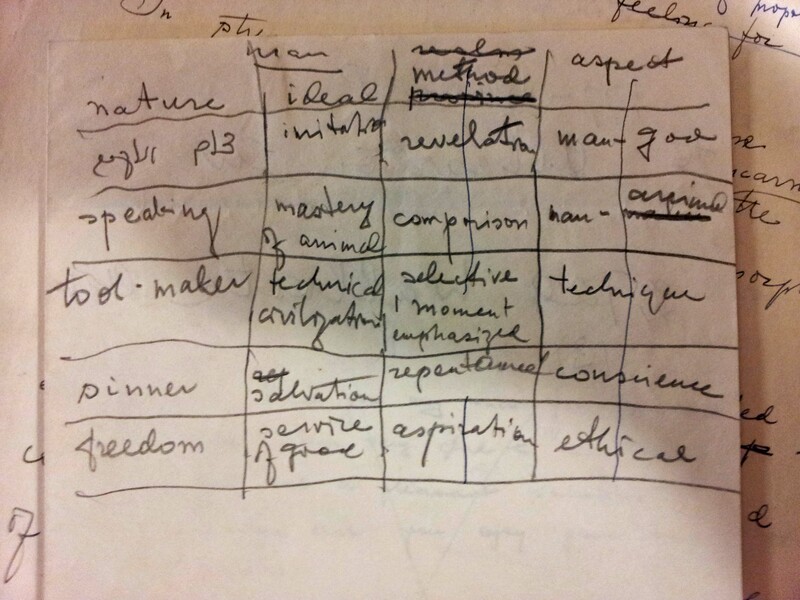 I recently processed a large folder of materials that Heschel collected during his tenure at UTS and discovered that Heschel preserved the views of his dissenters, tucked in alongside his lecture notes and grade records. In a folder that contains programs from events honoring Heschel at UTS and Eden Theological Seminary and an excerpt from Reinhold Niebuhr’s Pious and Secular America, I found a fascinating newspaper clipping. The article, “Scholar Delimits Interfaith Talks,” discusses another rabbi’s view on interfaith relations. The article explains that Rabbi Joseph B. Soloveitchik, professor of Talmud at Yeshiva University, argued that Jews should avoid discussing theological issues in their relations with Christians. This article provides an intriguing counterpoint to the documents promoting Heschel’s theological lectures at Christian Seminaries. 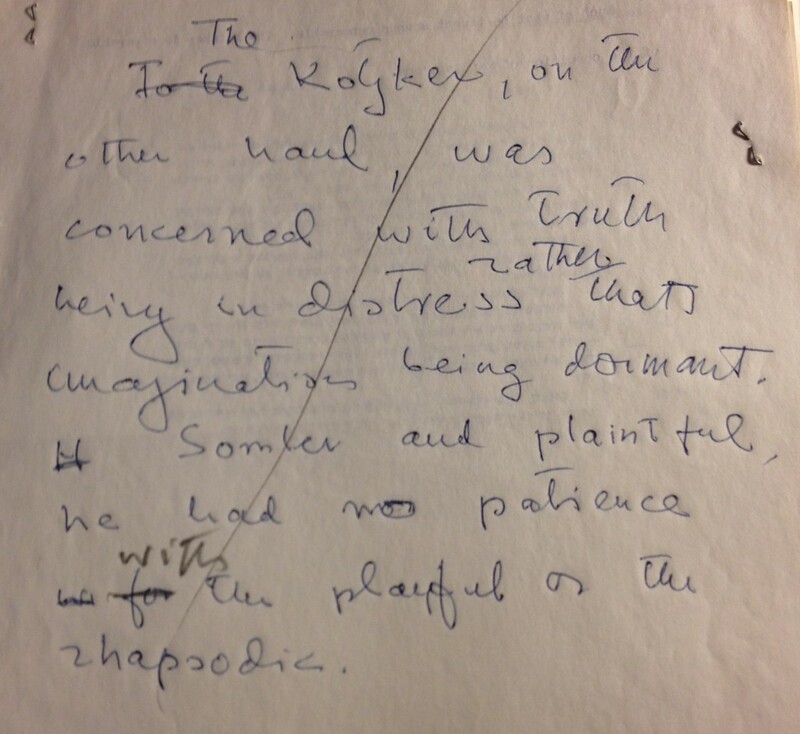 In another folder, which Heschel labeled “Interfaith,” he included an excerpt from a letter written by the Lubavitcher Rebbe, Rabbi Menachem M. Schneerson. In the letter, Schneerson writes, “there is no need for us whatever to have any religious dialogues with non-Jews, nor any interfaith activities in the form of religious discussions, interchange of pulpits, and the like” (2). Schneerson concludes, “religious dialogue with non-Jews has no place in Jewish life, least of all here and now” (4). This letter rests alongside an article written by UTS President John C. Bennett and Heschel’s itinerary for the Spring Semester of 1966 which included lectures at the Indiana Pastors’ Conference and eleven different Christian seminaries. 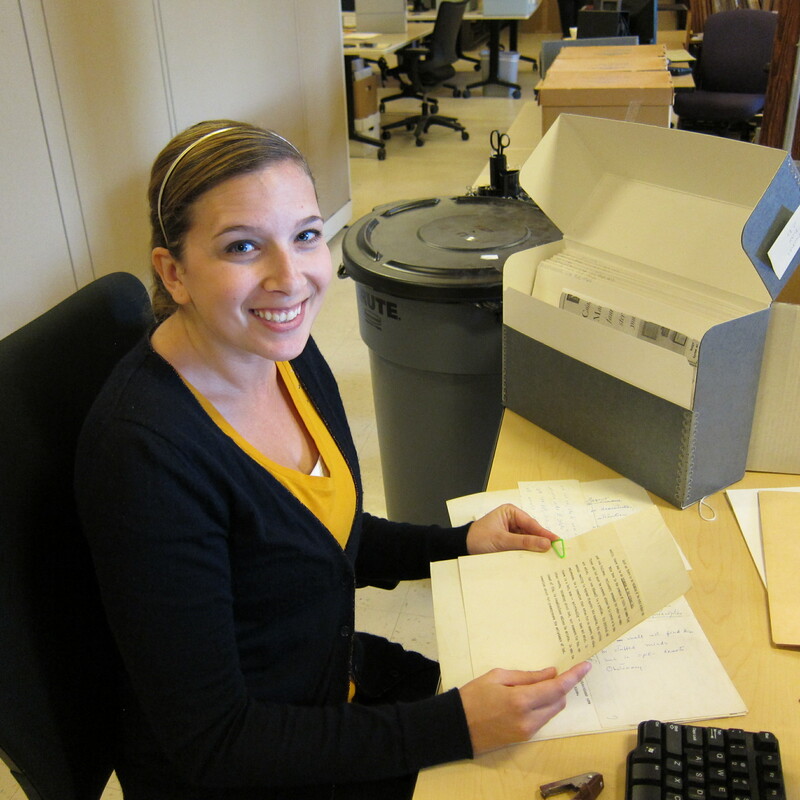 Adrienne and the Heschel Papers. These dissenting opinions preserved by Heschel and included in folders that highlight his interfaith work provide an intriguing glimpse into Heschel’s world. We will leave it up to future researchers to discover the meaning behind Heschel’s inclusion of these opposition opinions in these particular folders!